Ghost Shrimp are a scavenger type freshwater shrimp. They have a reputation for being constantly on the prowl searching for something to eat. Often, Ghost Shrimp will subsist on a diet very tiny bits of uneaten food, dead or decaying plant matter. They also eat other soft edible matter accumulating on the bottom of the tank. Occasionally, Ghost Shrimp can be seen eating a fallen tank mate. While Ghost Shrimp will eat the remains of fish and sometimes snails, they are particularly interested in eating the remains of other shrimp. They especially eat the shell if its soft enough. The Ghost Shrimp eating a dead Amano Shrimp appears to be having a real feast. The Ghost Shrimp appears interested in ingesting both the flesh of the dead shrimp as well as its soft shell. 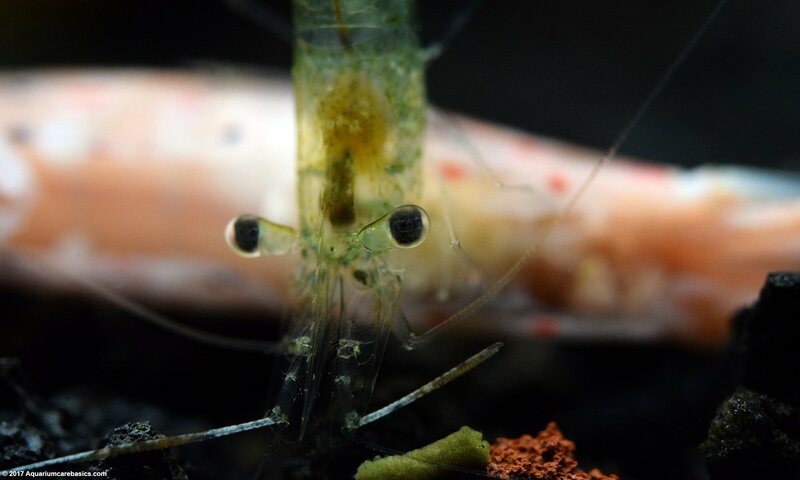 A Ghost Shrimp will eat soft shells to recoup their minerals to help get themselves ready for their next molt. While its good practice to remove dead tank mates from aquarium water as soon as possible, it is a good idea to leave shrimp shells in for a while to give other Ghost Shrimp a chance to take needed minerals. As long as a Ghost Shrimp is actively feeding, let the circumstances play out. When Ghost Shrimp appear to be finished eating minerals from the shell, remove the remaining uneaten portion to keep the tank clean. Avoid the buildup of excess organic matter and ammonia spikes in the aquarium water. In addition to Ghost Shrimp eating dead Amanos, they will often be interested in eating other deceased tank mates, including snails and fish.